White Clock With Word Order Now PowerPoint Templates And PowerPoint Themes 1012-"Microsoft Powerpoint Templates and Background with clock with order now"-White Clock With Word Order Now PowerPoint Templates And PowerPoint Themes 1012-This PowerPoint template can be used for presentations relating to-"Clock with order now, business, communication, success, clocks, marketing" Our White Clock With Word Order Now PowerPoint Templates And PowerPoint Themes 1012 are good for any contest. They enjoy every challenge put to them. Deliver your address with great fervour. 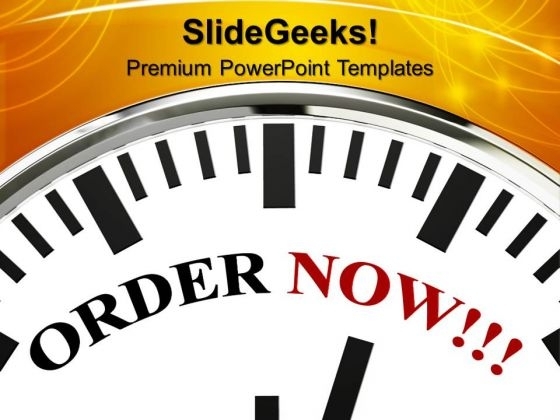 Our White Clock With Word Order Now PowerPoint Templates And PowerPoint Themes 1012 keep the enthusiasm at high pitch.